I t was 14 degrees Celsius up here in Baguio City when we arrived to join the University of the Philippines(UP) Baguio Mountaineers Trail Run 2010 this morning. The cool temperature suited the runners’ mood for a 13-K run for trails which kicked off at Scout Barrio. The event started at exactly 8 AM after the briefing and orientation, with more or less 80 participants. Greenpeace supports the 7th Edition of the Run for Trails 2010 which is an annual run organized by the UP Baguio Mountaineers to highlight the importance of conserving our forests and promote trail running as a sport. 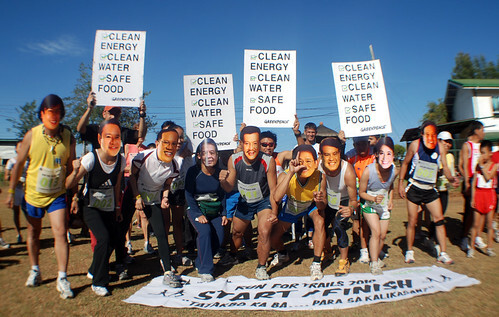 Also, some runners wore masks of the 7 presidential candidates and some held placards with a message challenging the presidential candidates to take up environmental concerns in their campaign platforms, especially since these issues impact on basic needs: clean energy, clean water and safe food. Our participation in the UPBM Run for Trails 2010 is part of the Green Electoral Initiative (GEI) which aims to focus on the environment platforms of electoral candidates. This year’s Earth Run is very significant as we are in an election year, and we are also in the midst of a very warm summer in an El Nino year. After the run, UPBM gathered all the runners for awarding and our very own Francis Joseph Dela Cruz gave a small talk about how important it is to conserve our forests. He also gave emphasis on the national elections this coming May that we should all exercise our right to vote and to vote wisely. He said that the current drought is a clear signal that securing our water supply must be a top priority for the next government which is why Greenpeace calls on the public through the Water Watch Project to seriously practice water conservation measures at home, such as reusing water, fixing water leakages and avoiding water wastage in any form. Presidential candidates also must inform the public how they will deal with this growing crisis during the first 100 days in office. how can i get involve in greenpeace…. i really want to voluteer… please help…. can i join but i am just 12 year old girl.. can i ?